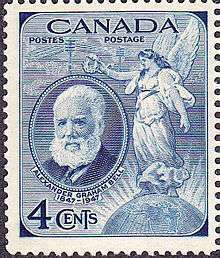 A commemorative stamp is a postage stamp, often issued on a significant date such as an anniversary, to honor or commemorate a place, event, person, or object. The subject of the commemorative stamp is usually spelled out in print, unlike definitive stamps which normally depict the subject along with the denomination and country name only. Many postal services issue several commemorative stamps each year, sometimes holding first day of issue ceremonies at locations connected with the subjects. Commemorative stamps can be used alongside ordinary stamps. Unlike definitive stamps that are often reprinted and sold over a prolonged period of time for general usage, commemorative stamps are usually printed in limited quantities and sold for a much shorter period of time, usually until supplies run out. 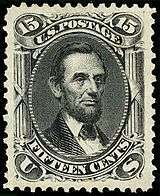 The United States 15-cent black stamp of 1866 depicts Abraham Lincoln, and was the first stamp issued after his assassination in 1865, but it was not officially declared as a memorial to him. 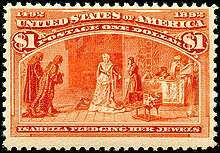 The U.S. also issued a 5-cent stamp in 1882 showing the recently murdered President James A. Garfield. In addition, the United States issued stamped envelopes for the Centennial Exposition in 1876, although technically these are postal stationery and not stamps. The British Jubilee Issue of 1887 may be thought of as commemorative of the 50 years' reign of Queen Victoria, although there are no special inscriptions on the stamps, and they were intended as regular stamps. 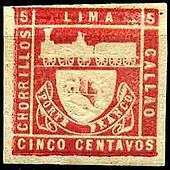 In 1871 Peru issued a 5¢ scarlet Locomotive and Arms stamp and is regarded as the first commemorative postage stamp, issued to commemorate the 20th anniversary of the first railway in South America. Though the United Kingdom often set the precedent for postage stamps and their designs, they were the late runners with the issue of their first commemorative stamp, not issuing one until 1924 when it printed and released the British Empire Exhibition issue of 1924. 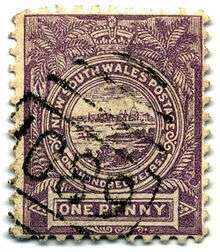 Other premier commemorative stamps were issued by New South Wales in 1888 to mark its 100th anniversary; the six types all include the inscription "ONE HUNDRED YEARS". Commemoratives followed in 1891 for Hong Kong and Romania. In 1892 and 1893 a half-dozen nations of America and Spain issued commemoratives for the 400th anniversary of the West's discovery of America by Christopher Columbus. The appearance of commemorative postage stamps caused a backlash among some stamp collectors, in the early years of stamp collecting who balked at the prospect of laying out ever-larger sums to acquire the stamps of the world, so they formed the Society for the Suppression of Speculative Stamps in 1895 to blacklist what they deemed to be excessive stamps. The organization broke up after unsuccessful attempts at getting collectors at large to comply with their wishes. Today the early commemoratives are still prized by collectors. 1 2 3 4 "Lines of stamp classifications have blurred, By Rick Miller". Linn's Stamp News. 2010. Retrieved 1 October 2010. ↑ "U.S. Commemorative Stamps". Alphabetilately. 2010. Retrieved 1 October 2010. ↑ "1924 British Empire Exhibition issue". The British Postal Museum and Archive . Retrieved 7 November 2010. ↑ "STAMPS, By Barth Healey, August 27, 1989". New york Times. 2010. Retrieved 1 October 2010.